March 22, 2012, 2:52 p.m.
By Adrienne LaFrance @adriennelaf March 22, 2012, 2:52 p.m.
Don’t ask C-SPAN founder and outgoing CEO Brian Lamb about the future of journalism. What he knows is that technology has transformed journalism in a way that’s “magic,” and that the Internet has enabled individuals across the world to adopt the mentality he had when C-SPAN first hit the airwaves in 1979. So Lamb, 70, built his own network, and did things his own way. “Virtually every new venture it has undertaken has been in defiance of conventional broadcasting practices,” The New York Times wrote of the still-fledgling network in 1985. C-SPAN has long been an early adopter, live streaming its content online before anybody else in the business, Lamb said. Earlier innovations that may now seem obvious include when C-SPAN began to take calls from listeners in 1980 (following the lead of trailblazers like Larry King, Lamb said) and the network’s decision to preserve rather than erase its recordings in 1987. 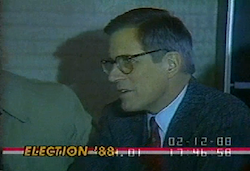 That was also the year of the Iran-Contra hearings, which longtime C-SPAN fans often point to as the coverage that first drew them to the network. 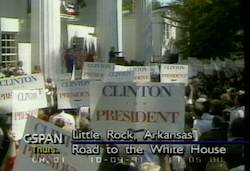 In 1988, C-SPAN enabled a presidential campaign to be “fully wired for sound” for the first time. The network was more ubiquitous than CNN that year, and it was still novel for a camera crew to follow a candidate (remember Pete du Pont?) into a Dunkin’ Donuts. In the mid 1990s, C-SPAN began live streaming online. In 2007, it changed its copyright policy to allow sharing and online posting of its videos. And in 2010, it posted its complete archive online (if you want to watch every second of original footage in the archive, it will take you more than 20 years straight — and counting). MSNBC host Rachel Maddow equated the move to “being able to Google political history using the ‘I Feel Lucky’ button every time.” Buzz-worthy video researcher Andrew Kaczynski calls the archive “incredible” for his political digging. Three decades since the first C-SPAN broadcast, Lamb says the network’s central goal is the same: empower citizens, the people who pay for government, to track what’s happening to their money. But that doesn’t mean Lamb expects his network to stay the same. Here’s our lightly edited conversation. Adrienne LaFrance: Broadly speaking, how have technological changes informed the way C-SPAN approaches its mission? Brian Lamb: Our goal really hasn’t changed. The world has changed, as you well know. At the moment, we’ve added tweeting and Facebook and all that. We use our website to cover events when we don’t have room on our three channels. But basically our mission has always been the same, and we still live with that mission today. If you had watched us in 1979, we’ve added a tremendous number of events — in the beginning it was just the House — but it really looks the same. Sometimes we get criticized for that, and sometimes we think maybe we should [upgrade]. People who watch us tend not to care about sets and stars. LaFrance: Looking back to 1979, talk a bit about the equipment you were using at the time, and what was considered state-of-the-art. Lamb: The first year we didn’t have any equipment. We owned a 1,000-character generator that we put names on a screen with. It was elementary. We tend in television to spend a lot of time and money on what things look like because it’s television. But we’re not what people define as television. We happen to use the television medium; we also use the radio medium. The journalism for us is what we choose to cover. A lot of people don’t even consider that journalism. We are a primary-source network. LaFrance: It seems as though when you launched, the idea of a primary-source network was radical, whereas now with the Internet and other technologies, the mainstream has caught up. Lamb: It’s a frightening thing about getting older. You find yourself as a member of the establishment, which I never considered myself to be when all of this started. Technology has moved in a wonderful direction, meaning that people everywhere can now create events or programs or documentaries for almost no money. LaFrance: One thing I’ve noticed in watching C-SPAN develop is the extent to which it has been an early adopter. For example, you offered free online streaming in — I think it was 1997. Lamb: I’m 70, and most people here are 15 years younger than I am, and they started when they were 22. They’re all vice presidents now and they’ve always been early adopters. We can take a risk, and can always take a risk. We don’t have numbers to sell to anybody. The spirit of the place is to experiment. One of the more difficult things is when people stop experimenting. We were the earliest people in this business to stream everything, and it was streamed free in the mid 1990s. There’s not a huge audience for this. It is serious information, and some days it’s not exciting at all. One of the things in television is people can create their own thing and they have to create every day, they have to make it interesting. We are just there everyday. We created this archive back in 1987, 180,000 hours that’s available for free to anybody in this country or the world to see. 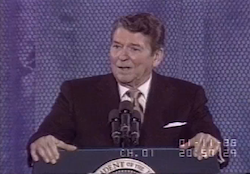 For instance, what did Ronald Reagan look like and sound like? Instant access to it. The beauty of a place like this is we can innovate and change on a dime. LaFrance: One could argue that the decision in 1987 to create that archive is as important as recording the material in the first place. Lamb: I think you’re right about that. I remember how it started: I went out to my alma mater, Purdue University, and I asked to meet with some political science professors. I did not know what I was doing, I was just at the table saying, “You know this would be a great idea for this school to do, create an archive.” One guy sitting at the table by the name of Robert Browning decided he was going to try to do this. He’s the inventor of the archive. That was one individual coming up with an idea and making it happen. That’s often as it is. LaFrance: I read an interview from 1999 in which you talked about the importance of the Internet but said that you yourself didn’t really use it. How about now? Lamb: Every minute. I’m totally hooked into the Internet. I have an iPad. I don’t watch that much television, but I have the iPad to call up facts that I want to know about anybody from a musician to a political figure. It’s absolute magic. Today I don’t do Twitter or Facebook. I’m behind the curve. Part of the reason is there’s only so much time in the day. But we use [social media] here a lot. We use it to alert people to what we’re doing, we use it to support background material on events we want to have. And where is this all going? I have no idea. None. LaFrance: Before you started C-SPAN, you worked in politics and public affairs for a bit. How did those years inform what you envisioned C-SPAN could be, and why it was needed? Lamb: I did do that, and I did it in three different locations. I did it in the Johnson White House — I’ve never been a member of a party and never will be — and just got to see up close what was going on. And then I did it working for a United States senator [Peter Dominick, R-Colo.] and the most interesting part of that was to see how the networks — he was in the minority — so to see how the major networks treated the minority. And then the next step was in the Nixon Office of Telecommunications Policy. I worked with — his full name was Clay Whitehead, and he was one of the great revolutionaries of all time when it came to changing television. He changed everything from the satellite use in this country to the breaking up of AT&T and the opportunity for people to make telephone calls that you never could under the old AT&T. It used to cost over a dollar a minute to call long distance! All of that changes with the policies he developed in those years. Watching that up close, it all added up for me to say there is more out there going on that the public can’t see and there ought to be a way to do it. A lot people would say now there’s too much. LaFrance: Do you believe that? Lamb: I do not. There can never be too much. LaFrance: Last year there was an FCC report on the information needs of communities, and one of the recommendations was to create a network of state-level C-SPANs. I wonder what you think about that. Lamb: There are already a number of state-level C-SPANs. Probably the most successful is in Pennsylvania and it’s a 24-hour-a-day, 7-day-a-week network. It’s run by the second person I ever hired here. He charges [cable operators] more per month than we do and he provides a service like no other, and he’s just gotten the Supreme Court to go on television there. My own opinion is if the rest of the country would follow his example, which is independent of the government, this kind of thing would be a bigger success. When you wait for the state to pay for it, it’s going to be a long wait. LaFrance: We talked about C-SPAN as an early adopter, but is there a technology or innovation that, looking back, you now wish the network had adopted earlier? Lamb: One of the great media innovators of all time has been Phil Donahue, and he’s not gotten the credit for a lot of stuff. The call-in. He was the first that I know of that did the faxes [reading on-air comments faxed in from viewers]. We thought at that time that this was the most magnificent, the most unbelievable thing. All these things start somewhere. Talk radio started in small communities and moved to Larry King, and now talk radio and calls are everywhere. We’ve been among the first almost in every case to jump on new technology. We’ve been slow on high-definition, and that’s hurt us on some of the cable systems. We’re still behind. That’s something that we probably could have done quicker. In the early days people would say, “Why would you care?” The answer is, we don’t — except everybody else is doing it. People will not watch that one non-high-def channel. But information is information. LaFrance: Is there any area of the political arena that you believe should be off-limits to a camera or microphone? Lamb: Not really. Anything that happens in public should be on-limits. It’s our government. We pay for it. They all figure out funny little reasons why you can’t televise this and you can’t televise that, but if it wasn’t for the public, these places wouldn’t exist. The Supreme Court is the best example. You can’t walk into a justice’s office. They get an enormous amount of privacy, but it’s easy to put it on television without disrupting anything. They make decisions based on briefs filed. To think that television would spoil that seems to me to be off the mark. LaFrance: You said that when it comes to the future of journalism you have no idea what’s to come. 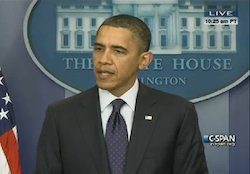 But what steps are you taking, and what steps must C-SPAN take, to remain viable in this changing media landscape? Lamb: We have to be there in every medium. We have to constantly think about how we’re going to be paid for. We don’t have advertisements. Maybe in the future you have to, to survive. We don’t charge anything for access to our product on the web. Maybe that has to happen at some point. But up until now, the industry has been very supportive. Who knows what the future is going to be? What we get a month compared to ESPN — we get about $0.06 and they get $7.00. The money part speaks more than anything as to what value people have supported. You can’t rest on your laurels in this business because this thing is flying with the new technologies. LaFrance: Business implications aside, when you think about how fast it’s moving, what’s your first reaction, on an emotional level? Lamb: My emotional reaction is I love what’s happening. I didn’t get in to this for any particular industry reason. I got into it for societal reasons because we just didn’t have enough openness. Now the opportunity to create is extraordinary. I watch old people, young people, people my age, creating things that they couldn’t imagine back in the days that I was growing up. The thing that keeps this nation at all up to speed is creativity. In the television business, unlike the print businesses, it’s been isolated to just a few individuals, and that’s no longer true. You can create your own channel on YouTube and feed that every day. It’s magic. In the end, you’ve got to keep your eye on who pays for it. There’s a lot of strange companies being created with a huge amount of power, and they’re all very nice today, but at some point Google won’t have the foothold it does toda. The same thing with Microsoft, Apple, and Amazon. The bigger they get, the more I would be concerned, because in the end government doesn’t like people who overwhelm. That’s how we got here. ABC, NBC and CBS were too powerful and people’s creativity was being pushed out. POSTED March 22, 2012, 2:52 p.m.
LaFrance, Adrienne. "How the rest of the world caught up to what C-SPAN founder Brian Lamb started in 1979." Nieman Journalism Lab. Nieman Foundation for Journalism at Harvard, 22 Mar. 2012. Web. 19 Apr. 2019. LaFrance, Adrienne. "How the rest of the world caught up to what C-SPAN founder Brian Lamb started in 1979." Nieman Journalism Lab. Last modified March 22, 2012. 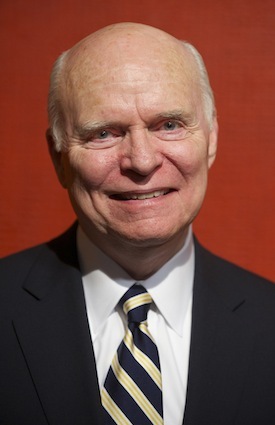 Accessed April 19, 2019. https://www.niemanlab.org/2012/03/how-the-rest-of-the-world-caught-up-to-what-c-span-founder-brian-lamb-started-in-1979/.